The U.S. Anti-Doping Agency announced Tuesday that MMA fighter T.J. Dillashaw has been suspended for two years following a positive test for a banned substance. 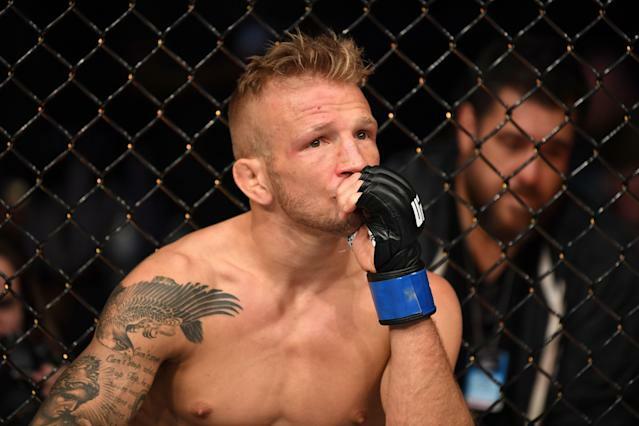 Dillashaw, 33, tested positive for EPO, or recombinant human erythropoietin. EPO stimulates the production of red blood cells, increasing the amount of oxygen transported to the muscles. ESPN’s Ariel Helwani tweeted the USADA’s statement on Dillashaw’s suspension. Two years is the maximum suspension Dillashaw could have received, but he’s not contesting the ruling. In March he voluntarily relinquished his UFC bantamweight title when the USADA originally notified him of the adverse finding. That sample was taken just before his fight against Henry Cejudo, which Dillashaw lost by TKO just 32 seconds into the first round. This is the first time Dillashaw has failed a doping test. But Cody Garbrandt accused him of taking banned substances in the lead-up to their bantamweight title fight at UFC 217.